Apparently, it’s an ongoing trend for me to be unaware of the hidden gems that lie within the gaming industry. My ignorance of the Monster Hunter series is an example of how narrow my horizons are. Monster Hunter World for the PS4 absolutely blew me away. All the hype that had spread throughout the gaming community actually caught my attention and I regret showing the tiniest bit of hesitation when I bought it because of the price. I had so much fun in the long run. The New World. That is the place that you travel to in the beginning of the game, and it’s the place you will stay throughout the entirety of Monster Hunter World. As the name indicates, in the New World, there are new monsters and creatures, both big and small that you will research and hunt with the Commission. The Commission is comprised of the people you work with at your base in the New World. Although the scenery is vast and breathtaking and the creatures are fresh and beautifully designed, not everything is hunky dory. Elder Dragons have started to gather in the New World for reasons unknown to the Commission. It is up to you and your little Palico buddy, as part of the Fifth Fleet, to gather research on the New Monsters in the world, and to soothe the restless Elder Dragons. As a hunter, you can choose to slay the monsters you encounter and carve their carcasses for materials. However, you can also venture out on capture investigations where you hunt down and weaken the creature you’re after and wait for the perfect moment to blast a couple of tranquilizer bombs in its vicinity while the monster is stuck in a trap. No matter what method you use to deal with the monsters of the New World, you obtain the monster’s materials, such as scales and claws, to make different weapons and armor. I made my Palico quite the handsome little cat with a fancy ladybug outfit. You have access to 14 unique weapons, each with its own property and skill cap. Depending on the weapon you choose, you have a vital role to play when it comes to fighting monsters with a team. Although you do not have to commit to these roles, the gist is that Hammer users aim for the monsters’ heads to knock them out. Insect Glaive users take advantage of accurate aerial attacks to mount the monsters and bring them down. And Hunting Horn users give various buffs to the people around them while also dealing out damage. These are just a few examples. But you can play however you want and change your weapon whenever you please. When I say that I’ve done a lot in Monster Hunter World, I’m referring to the 200+ hours I burned through hunting and going on investigations within the first month I spent with MHW. While fighting monsters, I have made new friends that I’ve joked with. They are the same people who showed me what the Monster Hunter Universe is really about, persuaded me to buy the game, and made my experience with the game more meaningful. Together, low rank quests were cake walks. The monsters were weak, except for the Anjanath: a pink and black T-Rex with a fiery sinus infection. We were able to make pretty solid armor, and when we finally changed the trajectory of Zorah Magdaros and kept it from destroying the New World, we thought we’d completed the game. But you can’t have “Low Rank” without its counterpart. High Rank was where the real adventure began for all of us. Aside from murmurs about its destructive nature, no one told me that I would be hunted down by a winged wyvern that tries to bomb me wherever I go! Bazelguese seems to always come at the wrong time during hunts, as the monster looms over you in the sky and shakes its neck to drop the bomb that grows on its throat. Bazelguese also dive bombs and breathes fire, which is why we call him the B52 Stealth Bomber. They called the Elder Dragon Nergigante rather vulgar names when it made its superman dive and killed us all in one hit. I won’t lie; Nergigante was one of my favorite fights because of the way he jumps around the battlefield to stomp you out as you struggle helplessly on the floor. The ultimate game changer for me was the battle with the Elder Dragons. Because of those fights, my favorite monster in this game is Vaal Hazak. Watching that decayed dragon rise out of a pile of bones in the depths of the Rotten Vale made my jaw drop. The rotten Elder Dragon had long curved claws that twisted unnaturally when its paw was down. Parts of its spine stuck out like spikes from its neck to the tip of its tail and a veil of dead flesh draped around its entire body. 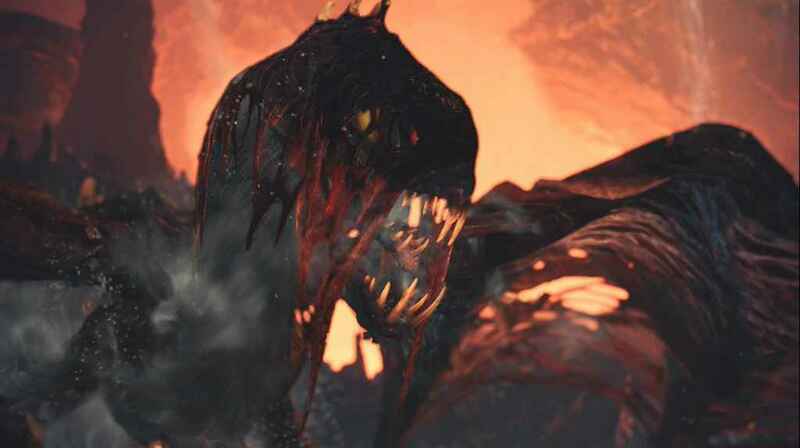 “That’s so cool” was the first thing that came to my mind, rather than “that’s so disgusting,” especially since Vaal Hazak had a separate loose jaw within his first jaw! To go along with my admiration for his design, the Vaal Hazak theme song is probably the only song I’ve been blasting in all my playlists. From the monsters I fought, to the many dishes I ate from the Meowscular Chef’s canteen, to the many times my cat Palico has saved me, there’s no doubt that I look forward to more Monster Hunter Adventures crossing my path in the future. And just like a capture investigation, I’ve been drawn into this game, and I’m pretty sure I won’t be abandoning the franchise any time soon. I learned not to let games that interest me pass me by. Just because I have no experience with the game doesn’t mean it isn’t worth my time. Monster Hunter World is a gem of a game, and I’m pretty sure it turned me into a cat person.